The calendar has officially marked the start of Spring, so there is now only waiting for the actual weather to reflect it, and dressing without a necessary additional layer in the time being. Since I've been home I've been feeling the need to do a big closet clean out. I've been trying really hard not to shop this year, and with the exception of a pair of pajamas, I haven't purchased any clothes or accessories this calendar year (you already know about the shopping I snuck in during the dwindling hours of 2018). Of course through some brand collaborations, new things have arrived all the same, and I'm trying to reconcile my closet so that it is no long in a state of chaos; and I don't have to buy more hangers. I know that has been my mantra for quite sometime, but clothing being perpetually camped out on a chair isn't much better of a solution. I've tried listing things on eBay, mostly as a way of assuaging my guilt when it comes to things I've barely, or maybe even never worn. Though for the amount of effort it takes to list things, to only sell at a fraction of the price I paid and even less than I'd hoped to get, I'm not sure it's worth it. I might just send a box to ThredUP, knowing full well I'll get pennies for every piece, but it might be better than nothing. Are you planning on any spring cleaning this year? Or did you start in January with the rest of the Marie Kondo obsessed crowd? I'm so excited that spring is here! Love this cardigan so much! 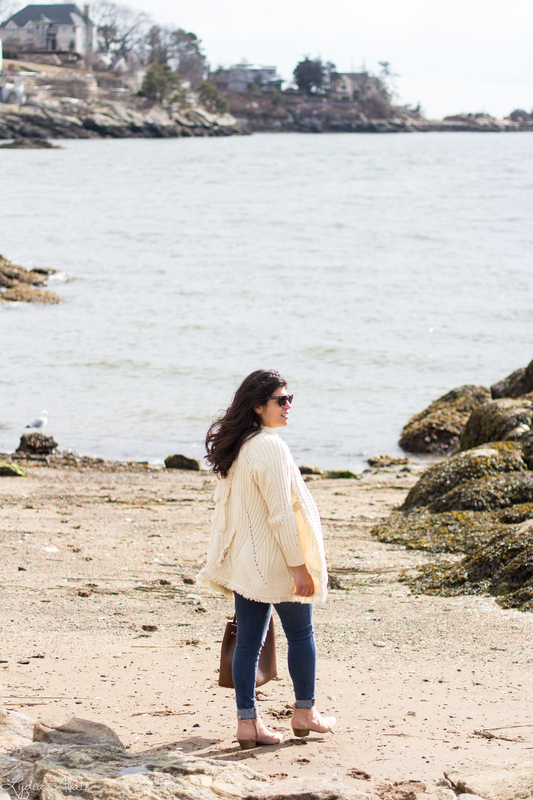 I loooove that cardigan, such a fun texture! Happy first day of spring!! Love that beautiful cardigan! 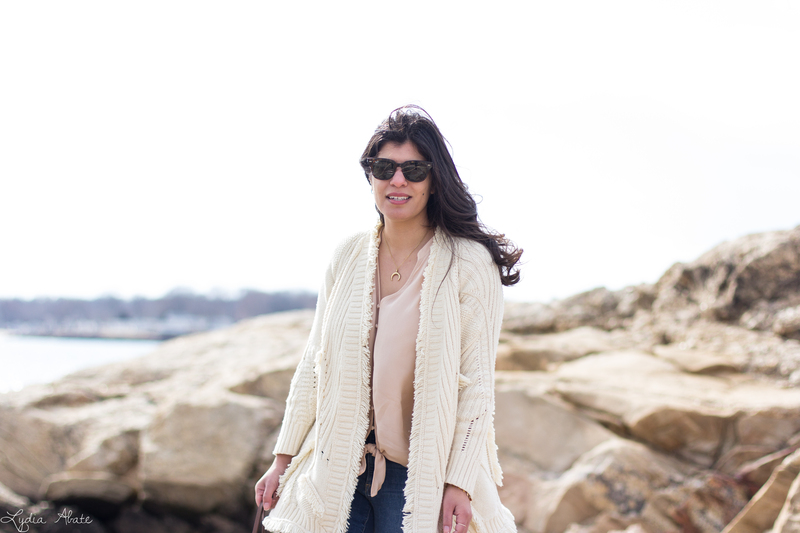 LOVE this look of the textured/fringe sweater! I've been sick for the last couple of weeks so no Spring cleaning has happened yet but I most DEFINITELY plan on it once I'm feeling better! Oh I absolutely love these pictures and the pastel colors of the outfit, specially the cardigan. I am no Marie Kondo fan, I take my time and have my own method. I don't handle regret well, so i continue with editing at least 5 items per month. AND I've been shopping, even during lunch time. I definitely need to do some spring cleaning- I am SO excited bc I just learned that we are getting posh mark here in Canada, so I’m going to spring clean by listing a bunch of stuff! Definitely going to be Spring cleaning! 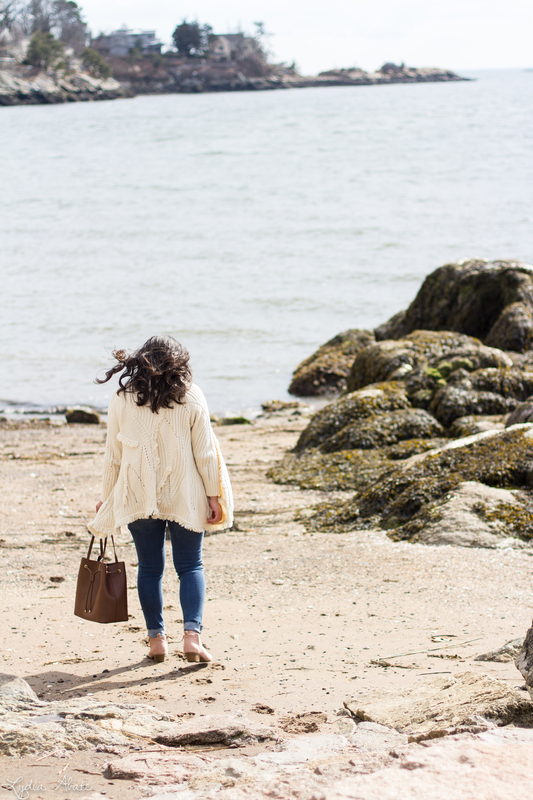 & I love this outfit, this Spring cardigan is perfect for the transition into the warmer seasons! Your cardi looks so cosy and so spring-like with the blush top! :) I did try a more aggressive declutter at the start of the year, I had time off and the boys still had daycare so I went through and got rid of a few bags of things (wardrobe and other stuff around the house) over a week or so. I think my wardrobe is something I struggle with though, and probably will continue to, I just attach too many emotions to clothes. I know what you mean with ebay too - I sold a piece for 99 cents (never went above starting bid) which means after ebay fees and paypal fees I made I think 20 cents from it? I paid over $20 for it...I guess as I don't have an expensive wardrobe I can't get much back when I sell it, ha! It's easier just to donate it! Oh my goodness, your cardigan and your blouse are both so cute! And so perfect for spring! I love spring cleaning via ebay, it makes it so lucrative! Loved the cardigan! 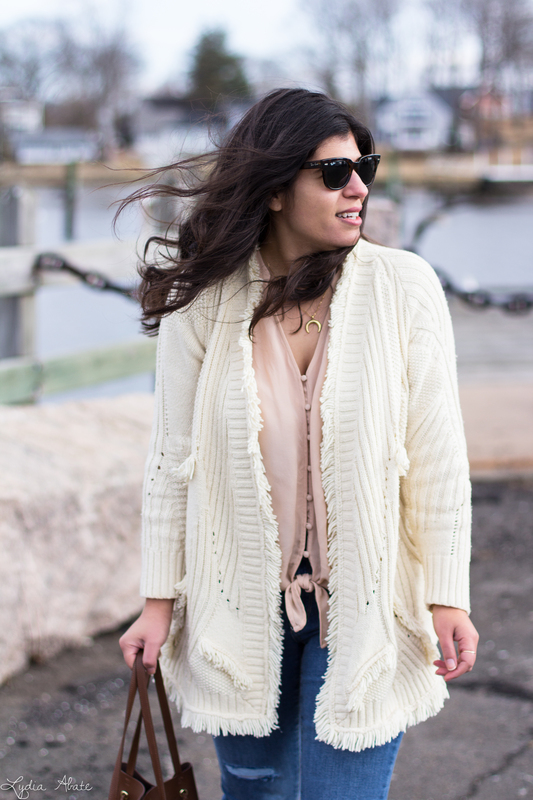 I'm in love with this cardigan and the fringe detail! I cleaned out my closet back in January, but it already needs another clean out! Happy spring! 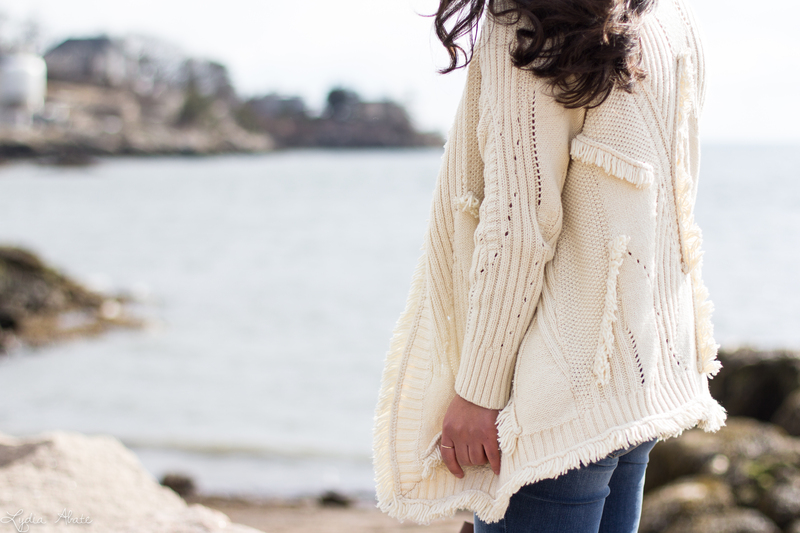 I love the texture detail on this cardigan. I'm so impressed you haven't shopped all year... you go girl! I love using Poshmark for selling my old clothing. I've used it for years and it makes it so easy to sell things. I always have grand ambitions of listing items and selling the, but it takes so long to list and it kills me to sell things for a fraction of the price. So they just add to my clutter and make no money in my closet. :( Love this look! The color of your blouse is so pretty and your sweater is beautiful! I have soo much spring cleaning to do, overdue for a closet purge myself. In the city, I always brought things to Buffalo Exchange. They give more $$ for store credit, so I'd save it for when I needed something new. Now, I'm not sure—Like you said, I never got much of anything from Thredup! LMK if you find a solution LOL. Yay spring! These photos are gorgeous--and I adore your outfit. I just love everything about this whole look. I've done a partial closet clean out this year, although I'd like to do more to make the actual space more appealing. Good luck with your plans! Ooh that Anthro cardigan is awesome! I'm with you on spring cleaning and am trying to even do it more often! I have so little closet space here and realistically only reach for certain things. It feels amazing to purge! Guess I'm part of the Konmari Method crowd that started in January .. only got as far as my closet though .. want to tackle the kitchen soon! I feel like I've tried everything for selling my closet. I even tried local consignment stores but the only website I had any kind of success on was Tradesy, and that was only for specific items. After more generic brands just didn't sell there I eventually sent them to Thred Up, if only to not "waste" the clothes. Good luck! Hope you find a good solution! Cute and cozy look you have here dear. Loving your matching button down blouse and booties.